Registered user can login directly by entering their login details (Please note that Password is case sensitive). 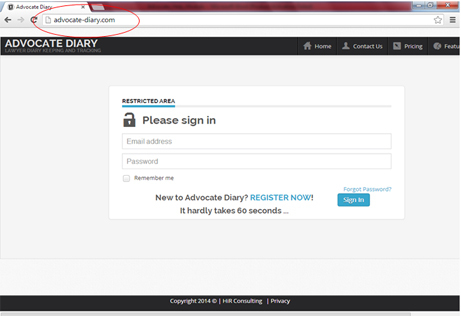 Here you need to provide your company name, company logo and some sort of other relevant information about your company to register on advocate-diary. 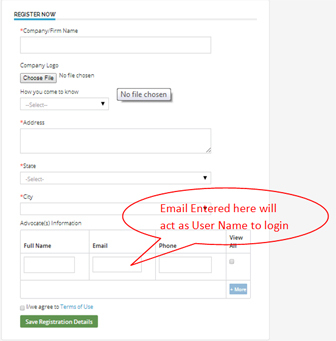 In case you are registering as individual and not as firm, enter your name in Company/Firm Name. In the section Advocate Information, at least detail of one advocate is mandatory. Your home page will look like this. Home Page allows displaying the cases of prior day and future day. A calendar is one of the most useful tools that a modern business can have. 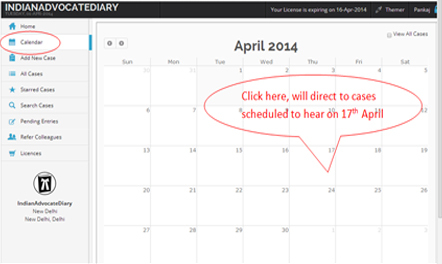 You can access to the diary and can find a time to suit you before you add next case. You can keep track on your monthly task in one go. It saves a lot of time of yours. It will help you out in conflict your task. This menu option displays current’s month calendar with couple of cases to be heard on months date. Click on the day of the calendar will give the entire cases schedule to be heard on that day. 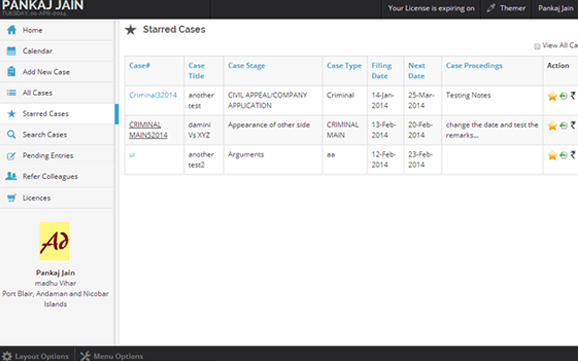 Add New Case allows entering the details about the Case filed in court. It has all the information which helps advocate in tracking and monitoring the case history/proceedings. The section gives user some features mentioned here. 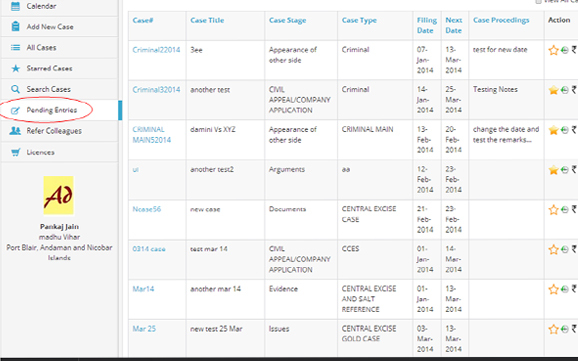 Case Title: The field in update section allows user to enter title of the case. This information is very important because this helps in recognizing the particular case. It is advisable that user enter the information correctly because this not editable field. Case No: Case number is usually the number allotted by courts which generally includes sequence number against type of case filed in the year. Court of: Allows entering the name of the court, case is mapped to. User can enter new item in the field by clicking the icon on the right side of the field. Once User adds new item, will be displayed in combo box. Case Type: User can enter the Type of the case viz. Civil, Criminal etc. User can enter new item in the field by clicking the icon on the right side of the field. Once User adds new item, will be displayed in combo box. Case Stage: Allows entering current stage of the suit. User can enter new item in the field by clicking the icon on the right side of the field. Once User adds new item, will be displayed in combo box. Filing Date: Date of filing the case. Appearing Lawyer: By default it gives the name of the user logged in. In case, there are multiple advocates in the firm, concerned advocate can be selected. Opposite Lawyer: Name of the lawyer appearing for the opposite party. Total Fee: Allowing entering the fee received from the Party. On enabling this option, system will send a SMS regarding next Date and proceedings entered in case history section) to party’s cell phone mentioned in Party Details Section. On enabling this option, system will send an email regarding next Date and proceedings entered in case history section) to party’s email Id mentioned in Party Details Section. Next Date / Previous Date: Allows entering scheduled date for hearing. System allows entering case proceedings against the hearing date in Case History section. Here you can go through all your cases in a single go .You can randomly select any case to see its progress and also allowed to make any changes in any of the cases directly by clicking on the Case ID. Then you can update the changes. You are also applicable to take some action on a particular case like you can give star to the most important case, can see the case history and pricing details. Clicking on the column heading will allow sorting. The column Action caters following features. Highlight the case by clicking the Star. It displays all cases, tagged as star. 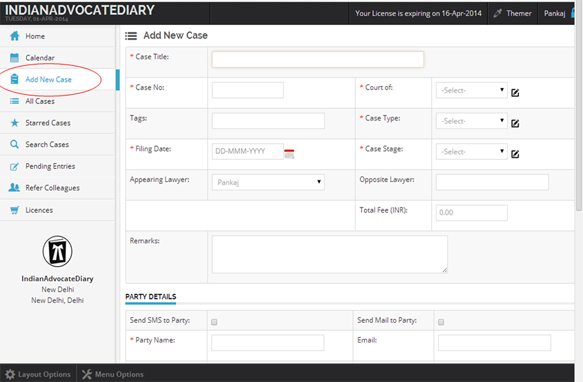 This feature enables keeping track of important cases on a single click. Sorting on Columns Heading gives you better control to manage the list and track the cases. 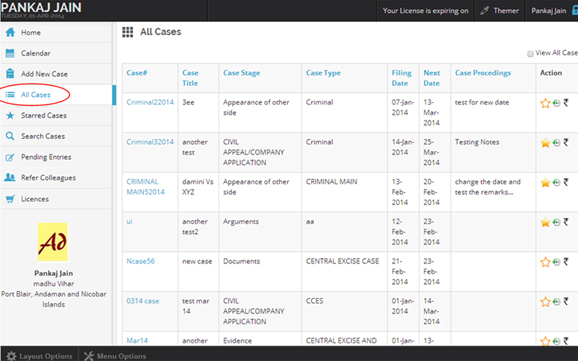 Search Cases enables user to glance through cases based on some information. User can enter information appropriately in one or more fields. This is very important feature provided to keep track of case where Next Date of hearing is not entered. User is advised to key in the information on the daily basis. By Default cases are sorting on Next Date. 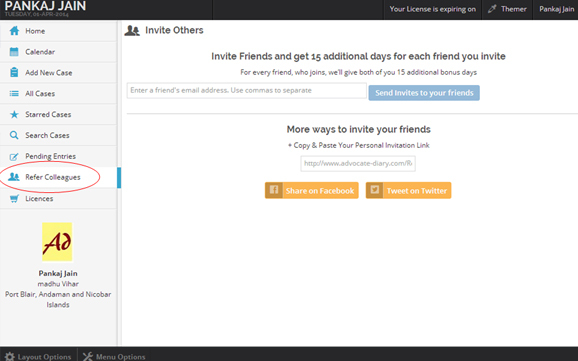 You can avail the benefits of extra 15 days by inviting your friends to join www.advocate-diary.com. It is simple. Just enter the email address of your friends and send them invitation or you can also invite friends by sharing your personal information link (generated by system) via social media. 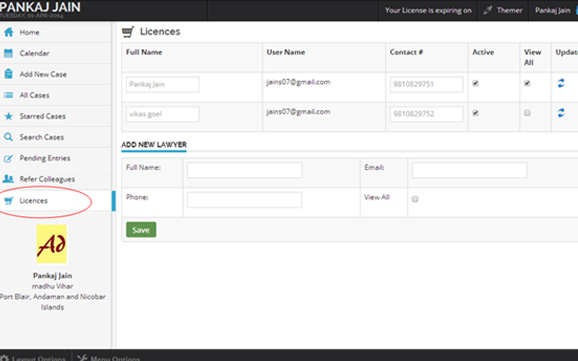 This link will allow primary user (multiple lawyer) to enable or restricts any lawyer’s access at any time. You can give the access to other lawyer as per your requirement. 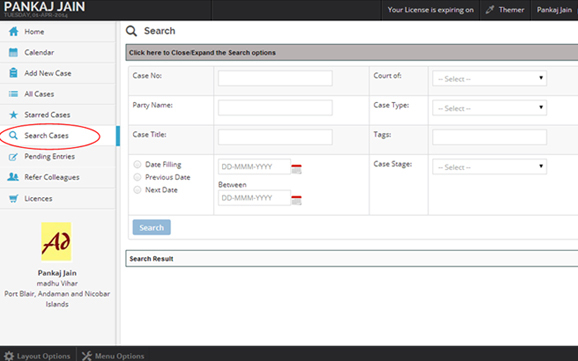 The page allows user to add Lawyers.